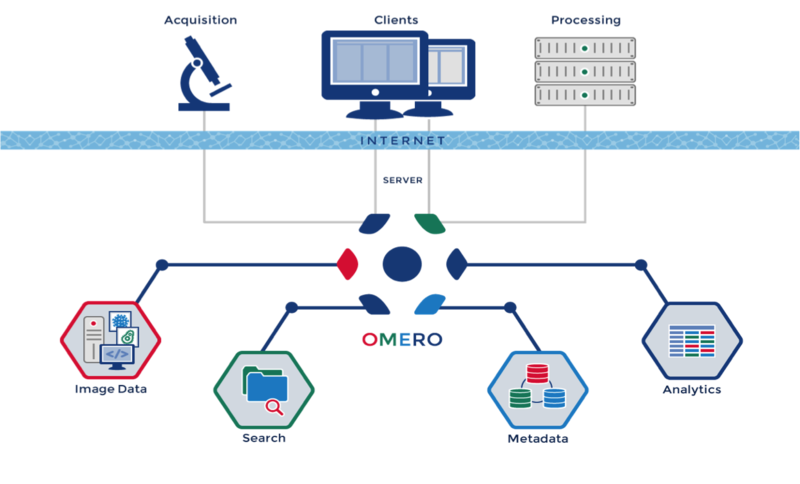 OME Remote Objects (OMERO) is a modern client-server software platform for visualizing, managing, and annotating scientific image data. OMERO lets you import and archive your images, annotate and tag them, record your experimental protocols, and export images in a number of formats. It also allows you to collaborate with colleagues anywhere in the world by creating user groups with different permission levels. OMERO consists of a Java server, several Java client applications, as well as Python and C++ bindings and a Django-based web application. The OMERO clients are cross-platform. To run on your computer they require Java 1.7 or higher to be installed. This can easily be installed from http://java.com/ if it is not already included in your OS. The OMERO.insight client gets all of its information from a remote OMERO.server — the location of which is specified at login. Since this connection utilises a standard network connection, the client can be run anytime the user is connected to the internet. This documentation is for the OMERO 5 Platform. This version is designed to improve our handling of complex multidimensional datasets. It allows you to upload your files in their original format, preserving file names and any nested directory structure in the server repository. For more technical information, please refer to the Developer Documentation. You can read about the development of OMERO in the OMERO version history. About OMERO introduces OMERO for new users, while the Features List provides an overview of the platform features with those that are new for OMERO 5.2 highlighted. Workflow-based user assistance guides are provided on our help website. As OMERO is an open source project with developers and users in many countries, connecting to the community can provide you with a wealth of experience to draw on for help and advice. Our partners within the OME consortium are working on integrating additional functions and modules with OMERO. See the Partner Projects page for details of the latest extensions which could help OMERO meet your research needs more fully. You can also extend the functionality of OMERO using OMERO.scripts, our version of plugins. Guides to some of the scripts which ship with OMERO releases are already provided, but you can also check out our Script Sharing page to find extra ones. If your institution does not have an existing OMERO.server for you to connect to, you can apply for an account on our demo server. Alternatively, you can create your own using a virtual appliance (a step-by-step guide for how to do this is provided). The virtual appliance is being discontinued. Previous versions will remain available for download but OMERO 5.2.1 will be the most recent release.